The NFL maintains the largest live-to-televised enjoyment disparity of any major sport, but that ought to dissipate come the postseason. Yet three playoff games still have thousands of unsold tickets remaining, and broadcasts in those areas could be blacked out this weekend. The deadlines are just hours away. Indianapolis's Saturday game against the Chiefs faces a slow slog toward a sellout. On Tuesday afternoon, the Colts—who have sold out 103 straight games—said there were more than 6,000 seats left; yesterday, that number had barely budged, to "over 5,500." The deadline, which is supposed to be 72 hours before kickoff, was extended a day because of yesterday's holiday, but they still need to close the gap by 4:30 EST today. The Bengals, facing the Chargers, have the largest number of unsold seats, about 8,000 as of yesterday afternoon (down from 10,000 on Tuesday), and the shortest time in which to sell them—their deadline is today at 1 p.m. They also have the cheapest tickets of any of this weekend's games—as "low" as $86. "We don't want to be the team that couldn't sell out a playoff game," owner Mike Brown said. The Packers—the Packers!—still have 7,500 seats remaining for their tilt against defending conference champs San Francisco. 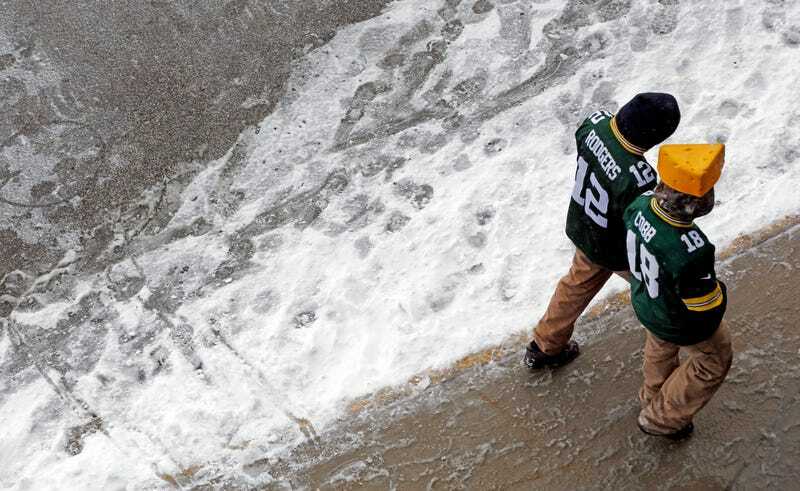 The weather will be awful—the forecast for Sunday is a high of zero—but this is Green Bay, where they're used to the cold and haven't failed to fill Lambeau for a home game since the strike-shortened season of 1983. Their deadline is 3:40 EST. Good job, Philadelphia! You sold out your game against New Orleans without a problem. There are lots of possible explanations. Weather, short notice, the probability of a loss, a combination of all those and more. But none of these reasons are unique to this season, and though the three cities in jeopardy are small markets, they are big football towns. The league may not have to deal with the embarrassment of multiple playoff games going untelevised in their local markets. If the teams are close enough to sell-outs, they can apply for deadline extensions. And the most likely outcome remains the teams or the league working with corporate partners to buy up any remaining tickets, achieving an artificial sellout. But that won't stop the NFL from having to face the disturbing possibility that the live football experience isn't the draw it once was.